As a British fashion icon, The Duchess of Cambridge was unlikely to let a trip to the seaside pass without it influencing her personal style. Kate wore a nautical-inspired dress for her visit to the headquarters of Ben Ainslie Racing in Portsmouth today as part of her work with the 1851 Trust, which encourages young people to get involved in sailing. 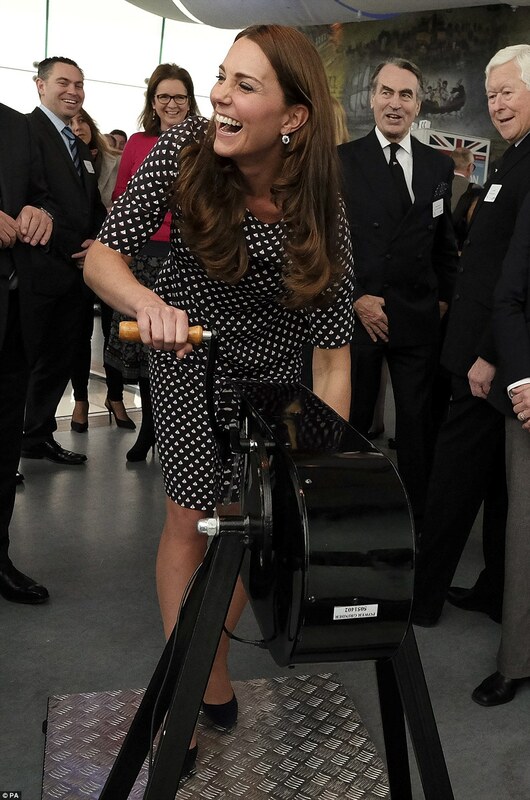 The loose-fitting boat-print frock by Somerset by Alice Temperley showcased the Duchess’s growing baby bump as she tried out a sailing winch simulator in front of staff at the 170m Spinnaker Tower which sits on Gunwharf Quays. The Trust’s new building is currently under construction and includes a mural wall painted by children drawn from six local schools. Earlier in the day, the Duchess of Cambridge joined the children for a spot of painting, creating her own picture of a sail boat on the communal artwork. Ever fastidious, the Duchess was careful not to get her cream £810 Max Mara Studio coat splashed during the painting session but smiled broadly as she chatted to a group of youngsters as she left her mark on the wall. The Duchess, who was also wearing a pair of £395 Jimmy Choo pumps, was also introduced to local artists, James Waterfield and My Dog Sighs. The pair have been charged with overseeing the mural, which depicts the skyline from Portsmouth to Ryde and includes views of the Isle of Wight and the Solent.